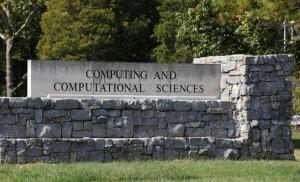 Oak Ridge National Laboratory is part of the Obama administration’s sweeping program to defeat cancer, joining with other labs and the National Cancer Institute on pilot projects that use supercomputers to analyze data on how cancer develops and to accelerate development of promising therapies. The Cancer Moonshot program, led by Vice President Joe Biden, hosted a summit Wednesday in Washington, D.C., to draw attention to projects around the country that involve hundreds of researchers, oncologists and technologies of many types. ORNL is part of “strategic computing partnership” between the Department of Energy and the National Cancer Institute. Four of DOE’s national labs are involved, including Oak Ridge. The partners include Oak Ridge, Argonne, Los Alamos and Lawrence Livermore National Laboratories, working in conjunction with the National Cancer Institute’s Frederick National Laboratory for Cancer Research. This entry was posted in DOE HQ, ORNL, Science, Supercomputing on June 29, 2016 by Frank Munger.